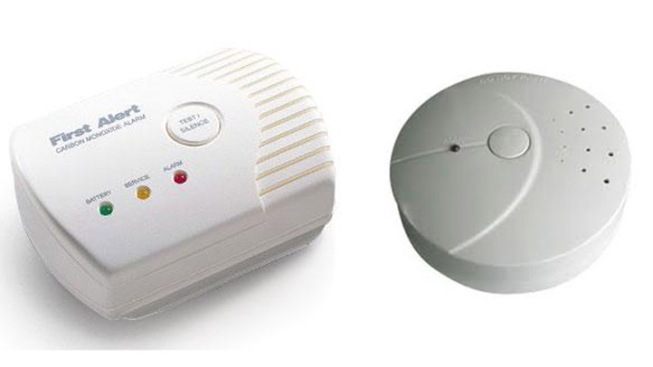 The Prince George's Fire/EMS Department will provide smoke alarms or carbon monoxide detectors to county residents. Call the Safety First program at 301-864-SAFE (7233) to request either. Two elderly residents of an Oxon Hill home were treated for exposure to carbon monoxide Thursday after emergency crews made repeated trips to their home for reports of them feeling sick - and after another firefighter found a deceased man in their home. It's not clear that the death of the man, who was 50 and had a "known medical history," according to the Prince George's County Fire/EMS department, was due to carbon monoxide poisoning. And emergency crews said they had no reason to suspect carbon monoxide was present until the final call - when their equipment found moderately high carbon monoxide levels in the house. The house had no carbon monoxide detector. The string of incidents started on Tuesday, when a man described as "70-ish" called 911 and said he felt sick. He was transported to a local hospital. On Wednesday, a "70-ish" woman called 911 to report feeling ill, and was transported to the hospital by a different ambulance crew. Later that day, another crew returned to the home and found the body. The cause of death is not known, nor is it known if carbon monoxide exposure was involved in the death. Then, on Thursday, an ambulance was sent to assist the elderly man and woman again, and emergency crews detected carbon monoxide. The victims were transported to a hospital in Baltimore that has a hyperbaric chamber, which is frequently used to treat carbon monoxide exposure. The department said in a statement that emergency crews had no reason to suspect carbon monoxide was a factor in any of the above incidents until this morning. "However, the Fire/EMS Departments Quality Assurance office will conduct a complete review of each incident," the statement read. The Oxon Hill home is in the same community where five people were poisoned by carbon monoxide exposure in April.